Buddy was one of the funniest people I had ever known. I met Sherry, his wife, at an antique auction. She was bidding on some pharmacy fixtures. I asked her if I could come and see them at her house, close by to where I lived in Beverly Hills. She said of course. At the house I met Buddy. We bonded right away. 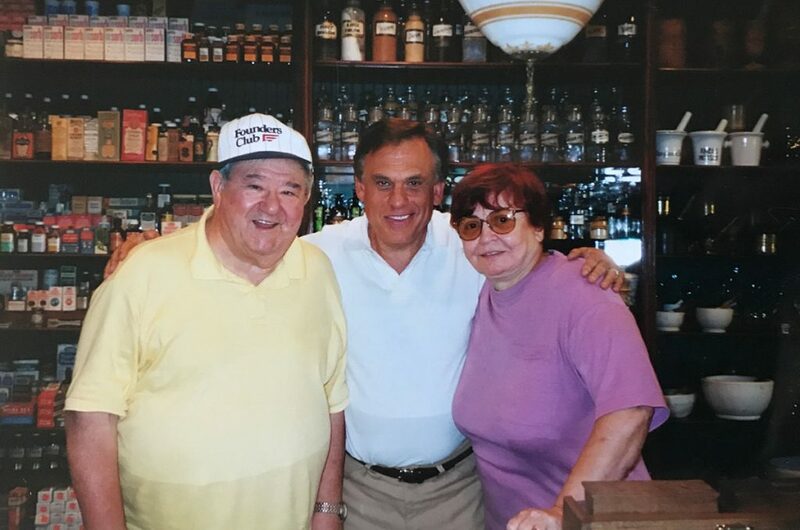 I shared my antique Pharmacy collection with the two of them in this picture. My favorite Buddy Hacket story is as follows: Buddy told me he was brought up in Brooklyn, with his brother and sister and mother and father in a small apartment with just one bathroom. Now he lives in a huge house in Beverly Hills, with 6 bathrooms, and he can’t go! !